Today I am visiting an early childhood program in search of art in the curriculum. I had been told that this program "doesn't do art." "How can this be?" I thought. "Art should be incorporated every day!" So off I venture, to determine what they are doing if they aren't "doing art." I enter the toddler room and look around at the walls. There are paper plates with cotton balls glued to them, along with black dots and orange triangles. There is no symmetry to these shapes, but I guess that the class was creating snowmen. In another space on the wall is a large sheet of white paper, and on it are drawings of various animals and their habitats. The children have drawn flowers at the bottom of the paper, and there are marks on lines which I assume to be leaves on trees. The animals are colored an assortment of bright colors: the chipmunk is brown and blue; the squirrel is red with green; the rabbit yellow, green, and purple. As I continue to look around the room, I see handprints on placemats, and paintings using a wide array of colors and objects in which to paint. There is "stained glass" in the window, which is actually tissue paper sandwiched between contact paper. There are family portraits with arms and legs extending from faces. All of this is developmentally appropriate art. All of this was created within the context of the daily curriculum, not as a stand-alone "art project." With so much attention today on early childhood development and with recent research on brain development, it is important to acknowledge that early childhood education begins the moment a child is born. Recent research on infant brain development has provided the reinforcement that others have long believed: that experience in the first three years of life has a powerful influence on life-long development and learning. From a baby's first lullaby, to a three-year-old's experimentation with finger paint, developmentally appropriate arts experience is critical. 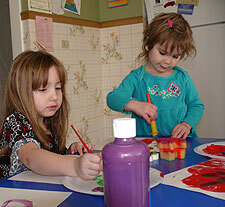 Art is central in the development of cognitive, social-emotional, physical, and language skills at all levels. 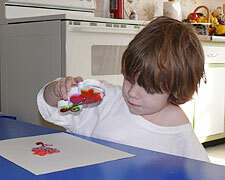 Children are motivated and engaged in learning when art of any kind is included in the curriculum. 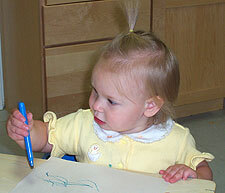 Whether it is music, movement, or visual art, the arts are natural for young children. Child development specialists note that play is the business of young children; play is the way children promote and enhance their development. The arts are a most natural vehicle for play. Please join us in celebrating art and young children by visiting our Young Children's Art Exhibit during Gallery Walk at the Robert H. Gibson River Garden, 157 Main St. in Brattleboro, from 5:00 to 7:00 p.m. on Friday, April 3. Activities for children and information for their parents will be available. Building Bright Futures and Early Childhood Educators' Network of Southeastern Vermont, along with Windham Child Care Association, invites the community to celebrate the Month of the Young Child during April. Other events and activities will be offered throughout the month.